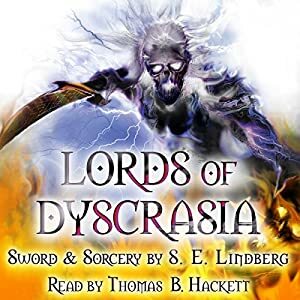 Foreword Reviews (J. G. Stinson 2011) raves: 5/5 stars "[Lords of Dyscrasia]... highly recommended, though not for the faint of heart... The pace is nearly breathless... makes the majority of current popular fantasy fiction read like recipes..."
"Lindberg is the real deal, a gifted writer with a strong command of language, and a soaring talent that stretches beyond the verbal: he illustrates his novel with his own wild and weird and excellent drawings. If you like action-packed dark fantasy with bizarre settings, an original premise and clever twist, then add this one to your Must Read List." Contact me for promotional codes (for reviews)!